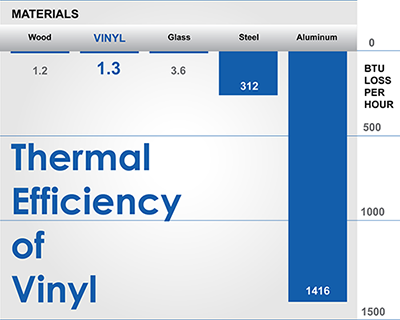 Vinyl is among the best materials in the world for providing thermal efficiency in your home. Not all vinyl windows are created equal. The type of vinyl used in the window has a direct effect on the quality of the product. Typically, vinyl windows are made out of a compound known as polyvinyl chloride, or PVC. In general, PVC can be difficult to push through the dies, in order to make the extrusion. To aid the PVC through the dies, plasticizers are added to make the compound more pliable. While plasticizers aid in the production of the extrusion, they can have some adverse side effects as well. Plasticizers can make the vinyl itself very dense and brittle, thus making the final product susceptible to cracking and the effects of ultra-violet light. This is not exactly the type of product most people would want in their home. However, there is an alternative: Unplasticized-polyvinyl chloride, or uPVC. With this compound, no plasticizers are added. Instead, other additives are mixed with the compound to provide protection from weathering, impact strength, and aid in the processing of the material. The final product is stronger, longer lasting, and will fight the effects of Ultra-Violet light. We are proud to offer several lines of windows using uPVC. Over the years, we have come to enjoy the benefits of offering these products, and we think you will too.